service, job creation/employee relations and community involvement. 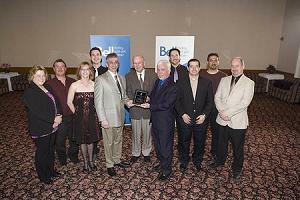 Quality Awards from Thunder Bay Chamber of Commerce. well being of our area is very much appreciated. Our sincere best wishes for ongoing success into the future. and the leadership you have in business are result of your hard work and dedication. You are an inspiration and a role model for all business leaders in Northern Ontario. and a commitment to providing continual quality and service excellence. You make us all proud! Granite Tops was awarded the 2003 Ontario Global Trader award in Market Expansion. We are very honored to receive this recognition. This award recognizes the pioneering spirit of Ontario SMEs that have successfully established themselves in a new export market(s) in addition to existing markets. There are two awards: one for exporters of products and one for exporters of services. A company must demonstrate a significant increase in export sales and job creation as a result of having entered this new market(s) and/or must have overcome difficult obstacles in order to establish themselves within the market. I am pleased to share with you that our Dinner and Silent Auction was a resounding success. We had 208 people attend the event and we raised over $8,800. I want to thank you for your donation of two granite cheese blocks because it played a big role in this fundraising event. Throughout the year we help and support individuals and families in our community. The proceeds from the Silent Auction enable us to maintain our level of services to the community in the area of counseling, supports to seniors and pastoral care.